Prime Factorization is the process of expressing a given number as a product of prime factors. When we write 30 = 2 x 3 x 5, none of the numbers 2, 3, 5 are composite numbers. 2, 3, and 5 are prime factors of 30. Thus we can say that 30 = 2 x 3 x 5 is the prime factorisation of 30. There are two methods to find the factors of the given numbers. 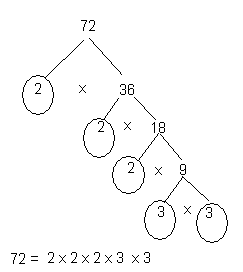 Example : Factor tree of 72 is given below. Another method to find the factors of the given number. Here also use the prime numbers. So start with 2 ,3,5,7 according to divisibility of the number. 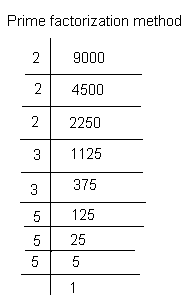 If we start with 2 then complete the division by 2 and then consider the next prime numbers. Express the following as product of prime factors.